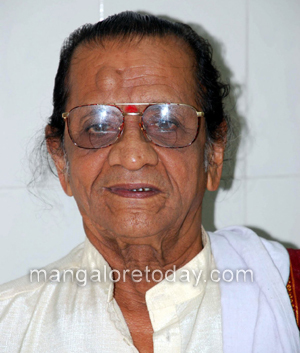 Udupi, Oct 4, 2017: Legendary Yakshagana artiste Padmashri Chittani Ramachandra Hegde breathed his last on 3 October at Kasturba Medical College and Hospital in Manipal. He was 84. Hegde had been admitted to the intensive care unit after he was brought to the hospital with a serious case of pneumonia. As per the reports, he eventually suffered a stroke and passed away. Known to be an exquisite Yakshagana performer for over seven decades, Hegde performed at the Navratri celebrations in Bangarmakki village from 21 to 25 September. He played Bheeshma on stage during the celebration, which was the last performance of his illustrious career. He was brought to the hospital on 29 September, where he was being looked after by his family. His prodigious talent was recognised both at the state and national level. Apart from being felicitated by his state, he is also the first Yakshagana artiste to have received a Padma Shri. Starting his career in 1977, at just three years old, he was motivated by his father to dedicate himself to his art fully. Hegde is survived by two sons, both of whom are also following their father’s footsteps, professionally. Popular for donning the role of several mythological characters, Hegde’s Kaurava, Keechaka, Karna, Kamsa and Bhasmasura are some that he was popular for. Well this man is great he has performed on the stage recently . May his eternal soul rest in peace.